A pillar of our goat packing community needs our help today. On March 24, 2019, Dwite Sharp was involved in a serious head-on automobile collision. Though he sustained some injuries,including a severely broken ankle and a fractured vertebrse, he is going to be ok. But it’s going to take some time to recover. Dwite & Mary Sharp are the owners of Paradise Ranch Packgoats and the foremost breeders of pack goat kids on the planet. Dwite and Mary do a colossal amount of good for goats and goat packers. They pour their hearts & souls into producing the finest pack goats at a substantial sacrifice of time, money, sleep, etc. Dwite is an avid supporter of NAPgA through Annual Rendezvous participation, verbal promotion, and financial donations. 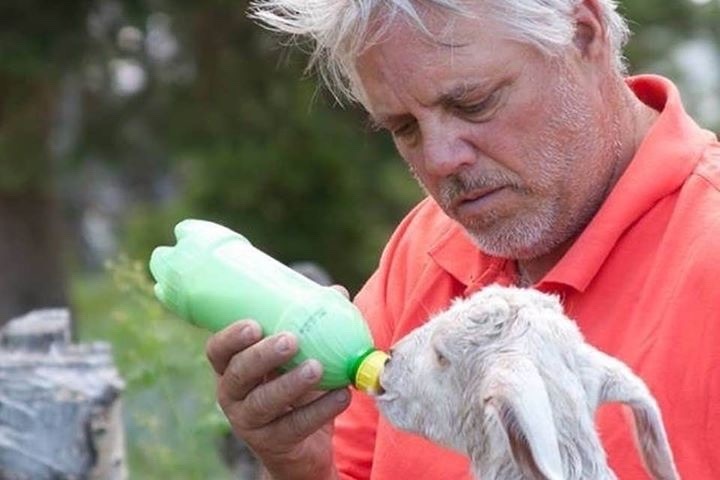 He has also been a mentor to hundreds of goat packers, whether they are customers of Paradise Ranch or not. This community will never be able to repay what Dwite & Mary have done for all of us. This setback has happened at Paradise Ranch’s busiest time of year. They are currently caring for dozens of pack goat kids with dozens more to come. As Dwite works to recover from his accident, we’d like to do as much as we can to ease his burdens. Donations to this campaign will go directly to Dwite & Mary Sharp at a time when they need it most. Please join us in helping our friends with your donation.